Vegan scrambled tofu aubergine wraps!! 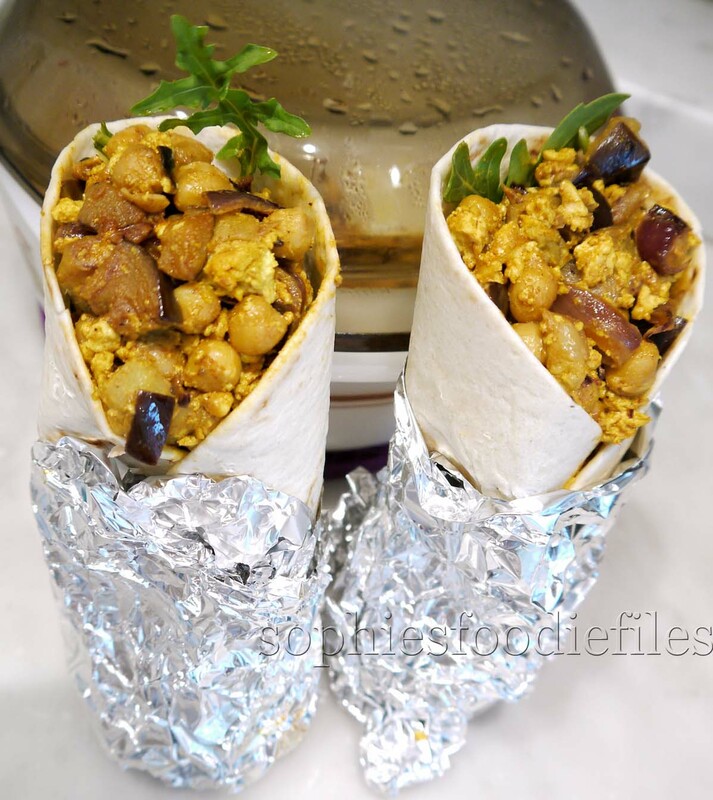 Tasty vegan scrambled tofu & aubergine wraps! Today, at lunchtime, I made these tasty vegan scrambled tofu aubergine wraps. They were super scrumptious! Vegan power! Check out this tasty vegan deliciousness! Fantastic filled vegan protein packed power wraps! 1/2 teaspoon turmeric + 1/2 teaspoon turmeric!!!!! 2 vegan tortilla wraps: you can make this gluten-free by using GF tortilla wraps! 1. First, make your veggie tofu scramble. Take a large non-stick pan, pour 2 swirls of sunflower oil in it & heat up on medium-high. When hot, add garlic & onion wedges. Fry 2 minutes. Now, add a few knobs of vegan butter & the aubergine chunks. Sir often. After 5 minutes, add chickpeas, 1 teaspoon of mild smoked paprika, 1 teaspoon of Maldon sea salt, 1/2 teaspoon of turmeric & 10 grins of black pepper. Sauté. Stir often for 5 minute or so & then, add a few splashes of hot water to the pan, if you need to, so that the spices won’t stick to your pan. Transfer the veggies mix to another large pot with fitting lid. Add a bit of vegan butter & add tofu, that you crumble between your clean hands into your pan. Crumble the tofu well but don’t crush it, just lift it up & swirl it around the pan. It need to be chunky! Fry for about 10 minutes max. Lower the heat if the tofu gets sticky to the pan. Add some extra sunflower oil, if you need to. Add lemon juice, 1/2 teaspoon turmeric & nutritional yeast too. Stir often everything round in the pan. If the tofu sticks to the pan, add some hot water to prevent sticking! Taste! I added 1/2 teaspoon of Maldon sea salt & 8 grins of finely milled black pepper. Stir well around in the pan. It has to taste soothing & fab! Mix the scrambled tofu with the rest of the veggie & chickpea mix into that larger bowl with fittting lid. 2. In the meantime, heat up your tortilla wraps according to your packet instructions. Plate up! Take a warm & pliable wrap & place 10 fresh rocket leaves in the middle of each wrap. Place tofu & veggie scramble on top of the rocket leaves, all over the middle of each wrap, a few tablespoons, leaving the sides uncovered. Now, first, fold the bottom to the inside , fold the left side & the right side to the middle & carefully roll the wraps up! I place each 1/2 of the end of each wrap into aluminium foil to eat it more easily. After being carefully wrapped in foil, I added at least 2 tablespoons of the filling to the inside of the tortilla. So that it is fully packed! Things will be kept together nicely! Enjoy it once or twice! 🙂 MMM! MMM! Power packed vegan wraps! Previous Post Vegan stuffed pasta shell oven dish! Next Post Beans bar in Mechelen: One of my 2 favourite special coffee bars!!! Great way to use eggplant, Sophie! Yum! I agree here! Enjoy, Annie! I find eggplant fascinating…..it cross cultural and culinary boundaries incognito. I would like to taste such a lovely wrap. Well done! What a great wrap, lovely recipe… and gorgeous images! All very yummy indeed. Yum! I’ll have to try this in place of our traditional breakfast tacos. You must! This is very tasty & easy to make too! Looks incredible Sophie!! The flavors and veggies are an awesome combo! yes, they are! Enjoy them too! Oh my goodness these wraps look so delicious Sophie!! You always have the most amazing recipes! 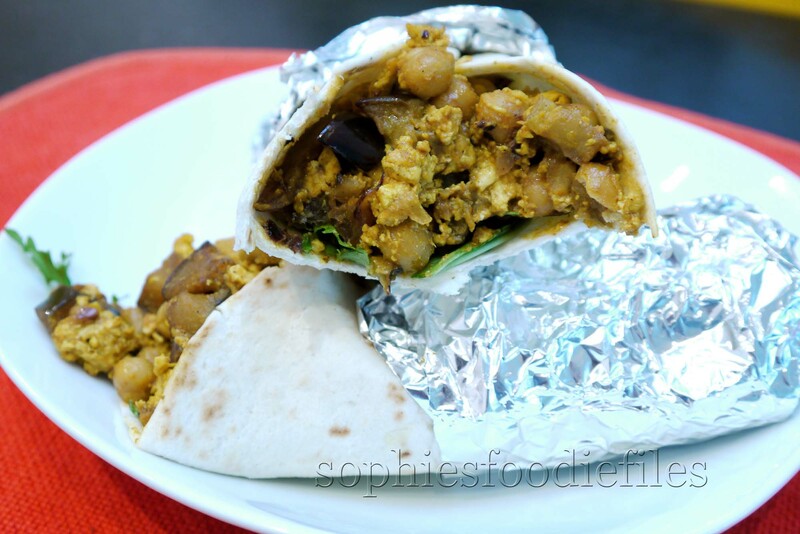 Any recipe that includes aubergine and chickpeas is right up my alley; even more so if it’s packaged in a wrap. Yum! Me too! I never combined these 2 ingredients before but they do pair so well together, I agree & know that now! The Queen of Vegan…bravo,you’ve done it again…love it!!! Thanks! Enjoy those tasty wraps! Vegan power is right, Sophie! I love that you used turmeric, too- such a powerhouse ingredient. I think the combination of aubergine and chickpeas would be awesome! It seems kind of Moroccan. Yummy!!! This sounds delicious and oh so healthy. Ever thought of using chickpeas sprouts instead of canned chickpeas? I will check this out for other recipes! Thank you, Norma! 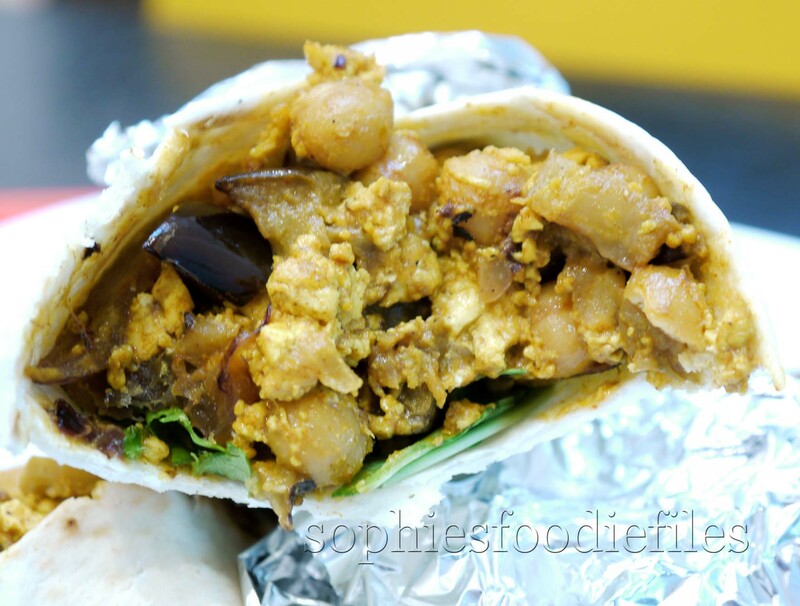 Delicious wrap Sophie…like the combination of eggplant and tofu…great meal. Sounds and looks delicious! A great lunch! That is so true: yummy too! Yummy! I’ve been trying to find more recipes to cook eggplants. These looks so good and healthy! It is a must from now on! Thanks, Ally! Enjoy them too! that looks like a breakfast burrito I could sink my teeth into!! What is a burrito? Thanks! Hi Sophie, thanks for this recipe, it looks delicious! I’m not normally a fan of tofu, but with the seasoning you’ve added, I might just be converted! I was not a lover at first either but I love to marinate it a lot: That adds tons of flavour too! 🙂 Enjoy these wraps! You do that, Barb! Enjoy them! Oh My Sophie! I want one!! Delicious, I’m definitely going to make this! These wraps look so delicious and healthy! Thanks for sharing them Sophie!